A WebmasterWorld thread asks why is Google showing RSS feeds in the Google.com web search results. You know you see them. You do a search and an .xml or .rss or atom result comes up in the results. Why does Google bother including them in their web search index when it is, by definition, a duplicate copy of the content from the main site? I'm with you, it is frustrating and it seems to me to be a waste of real estate on the SERP. Yeah, RSS in the SERPs is among my biggest peeves. A complete waste of time for the user. I'd be happy to seem them go too. But one member does make a valid point. Most new browsers do have good support for RSS feeds. So a user will typically not be taken to a page of raw code, instead the RSS feed will be represented in the browser like HTML. Most real browsers do a good job of rendering an RSS feed, and an RSS feed when well rendered is no different to the front page of a newspaper - apart from the fact that it has fewer adverts and clutter. However, like I said above, what value add is this giving to the searcher? Yes, they can quickly add the RSS feed to their Google Reader subscriptions but what are the chances of a user wanting to do that. Most sites with RSS feeds give users that option on the home page anyway. Need an example of Google displaying an RSS feed in the search results? 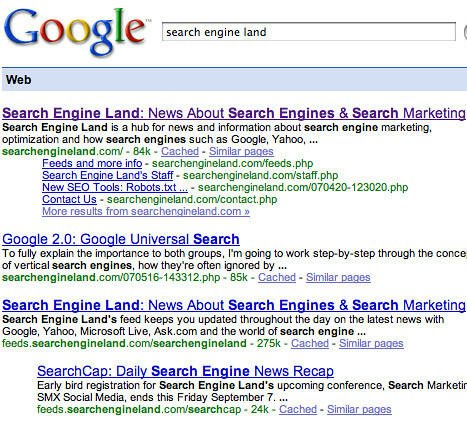 Check out a search for search engine land and the third listing down is the feed URL for Search Engine Land. Speaking of RSS feeds, the Search Engine Roundtable not only has a summary feed, we do also offer a full feed. So subscribe to which ever you prefer. Previous story: When Will Google Celebrate Their 9th Birthday This Year?